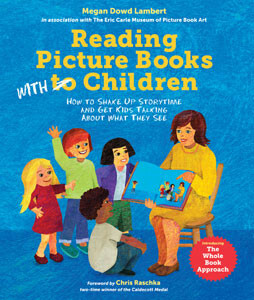 This excerpt from my book, Reading Picture Books with Children: How to Shake Up Storytime and Get Kids Talking about What They See provides an overview of my development of the Whole Book Approach, a co-constructive (interactive) storytime model that I developed in association with the Eric Carle Museum of Picture Book Art. I think of the Whole Book Approach as a means of reading with children, as opposed to reading to them, as it invites children to make meaning of text, art, and design–the whole book! Visit the The Carle’s page about its Educational Philosophy to learn about how the Whole Book Approach fits in with its educational programming. Throughout Picture Book Month, November 2016, I did daily tweet threads using the Whole Book Approach. Here is my blog post with links to every thread (you don’t need to have a Twitter account to access the threads). And, here is the list of all 375 picture books mentioned in these threads. 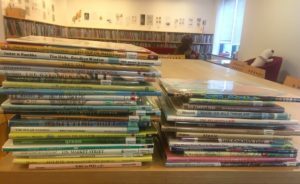 Some books on the list were recommended by readers, others are included on my 2017 Mock Caldecott list. 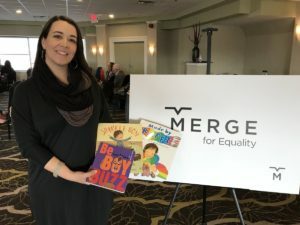 Recently I’ve been working on various projects that explore how Whole Book Approach storytimes can support children’s critical engagement with picture book representations of race, gender, class, and other aspects of identity in characterization. See my work with EmbraceRace and MERGE for Equality for more information about this developing area of my work. I’m so pleased that the Doors to the World initiative is including the Whole Book Approach in its resources for educators. 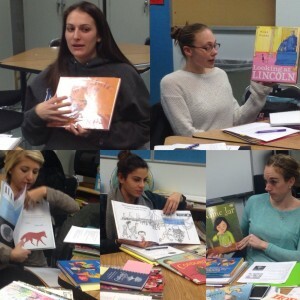 Here’s to “making global children’s picture books and teaching resources available to PreK to Grade 3 teachers” and fostering critical reading. School librarian Cari Young from Library Learners has written chapter-by-chapter blog posts about my book on her site in Spring 2017. It’s been so wonderful to hear from readers who are using the Whole Book Approach after reading Reading Picture Books with Children: How to Shake Up Storytime and Get Kids Talking about What They See. 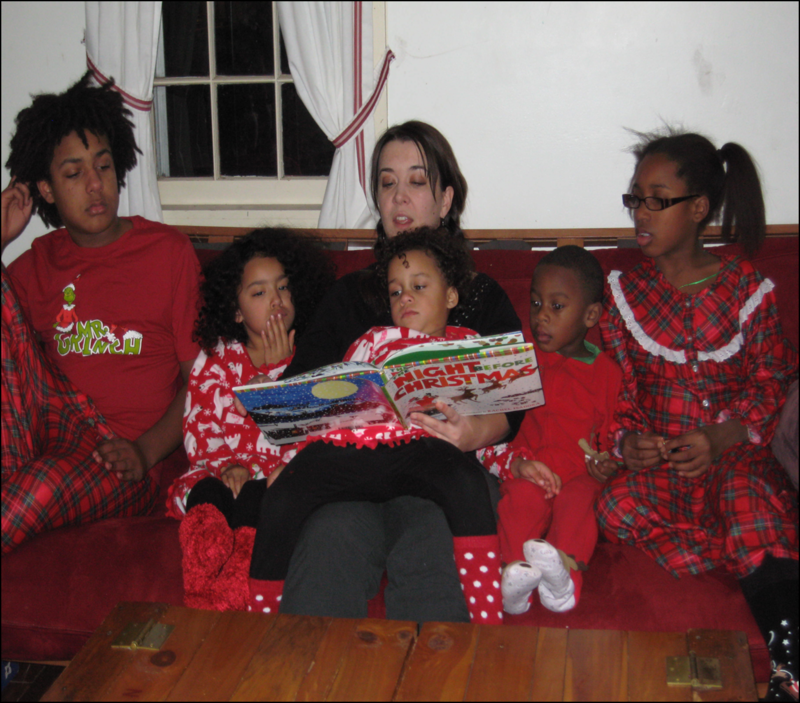 Reading with my own children at home played a huge part in my development of the Whole Book Approach. 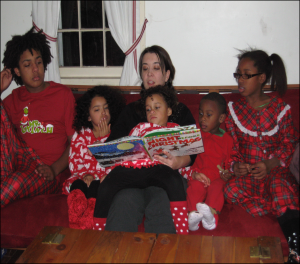 In this throwback photo I’m reading with five of my kids–all of whom are now book-loving tweens and teens. When I read with my sons and daughters we naturally do a lot of stopping and talking about text, art, and design, and I try to let them set the pace of these readings so that their questions, comments, and responses to my questions are an integral part of our reading. I want to bring this same interactive spirit to the storytimes I lead. I never want discussions to feel like we are just interrupting a book; I want them to feel like they are enriching our experience of story, art, and design. I’ll use the space below to post reader comments that I’ve received about how using Whole Book Approach techniques has enriched the storytime practice of librarians and teachers who’ve read my book, and I’ll also post reflections from booksellers, professors, writers, illustrators, and parents and other caregivers. This morning, on an outreach visit, I found myself in an awkward situation… The daycare provider forgot I was coming and only had one child there– a 7 year old. 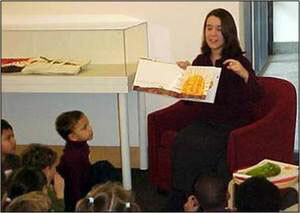 And all of my materials were geared towards the 2-5 year olds I usually see on my outreach visits. But, because I was currently reading Megan Dowd Lambert’s “Reading Picture Books With Children” I was able to put into practice the whole book approach…The first book I grabbed was Sam and Dave Dig a Hole and it was PERFECT for exploring the whole book… Upon asking “do you know what spectacular is” and that combined with the fact that the two were digging a hole the 7 year old said “It could be something spectacular like another dimension!” already, I was blown away. We took time to really look at each picture– each part of the illustrations. After we read the book he enjoyed comparing the house in the first few pictures to the one at the end… he even recognized that the endpapers were red and green to correspond to the fruit on the trees at the beginning and end!